This whimsical cartoon shows the three newly discovered extrasolar planets (right) casting shadows on their host star that can been seen as eclipses, or transits, at Earth (left). 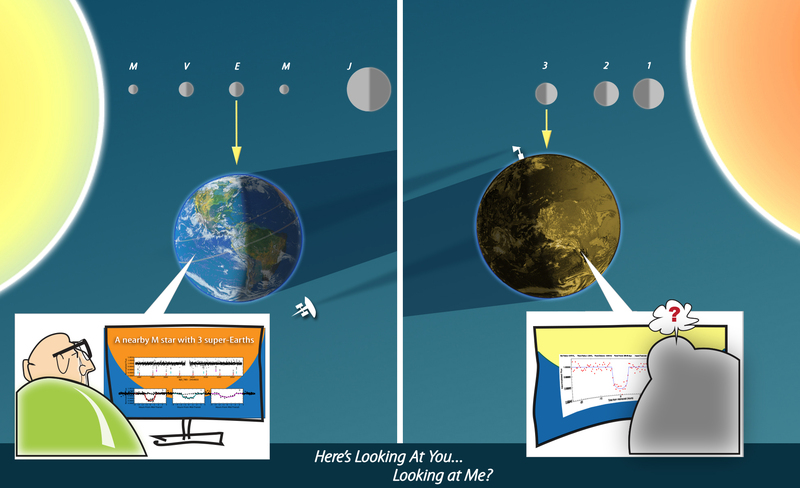 Earth can be detected by the same effect, but only in the plane of Earth’s orbit (the ecliptic). During the K2 mission, many of the extrasolar planets discovered by the Kepler telescope will have this lucky double cosmic alignment that would allow for mutual discovery—if there is anyone on those planets to discover Earth. The three new planets orbiting EPIC 201367065 are just out of alignment; while they are visible from Earth, our solar system is tilted just out of their view. High-resolution version. Credit: K. Teramura, UH IfA. Extrasolar planets are being discovered by the hundreds, but are any of these newfound worlds really like Earth? 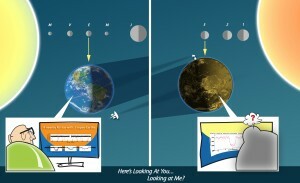 A planetary system recently discovered by the Kepler spacecraft will help resolve this question. The system of three planets, each just larger than Earth, orbits a nearby star called EPIC 201367065. The three planets are 1.5-2 times the size of Earth, and the outermost planet orbits on the edge of the so-called “habitable zone,” where the temperature may be just right for liquid water, believed necessary to support life, on the planet’s surface. In addition to Howard and Petigura, UH graduate students Benjamin Fulton and Kimberly Aller, and UH astronomer Michael Liu are among the two dozen scientists who contributed to the study. The confirmed planets were by the NASA Infrared Telescope Facility (IRTF) and Keck Observatory in Hawaii as well as telescopes in California and Chile. The new discovery paves the way for studies of the atmosphere of a warm planet nearly the size of Earth. The three new planets are particularly favorable for atmospheric studies because they orbit a nearby, bright star. Next, the team of astronomers that made the discovery hopes to observe the planets with the Hubble Space Telescope and other observatories to determine what elements are in the planets’ atmospheres. If Hubble finds that these warm, nearly Earth-size planets have thick, hydrogen-rich atmospheres, they will learn that there is not much chance for life. “A thin atmosphere made of nitrogen and oxygen has allowed life to thrive on Earth. But nature is full of surprises. Many extrasolar planets discovered by the Kepler Mission are enveloped by thick, hydrogen-rich atmospheres that are probably incompatible with life as we know it,” says Ian Crossfield, the University of Arizona astronomer who led this study. The discovery is all the more remarkable because Kepler is now hobbled by the loss of two reaction wheels that kept it pointing at a fixed spot in space. Kepler, launched in 2009, was reborn in 2014 as “K2” with a clever strategy of pointing the telescope in the plane of the Earth’s orbit to stabilize the spacecraft. Kepler is back to mining the cosmos for planets by searching for eclipses, or transits, as planets orbit in front of their host stars and periodically block some of the starlight. “I was devastated when Kepler was crippled by a hardware failure,” Petigura added. “It’s a testament to the ingenuity of NASA engineers and scientists that Kepler can still do great science.” Kepler sees only a small fraction of the planetary systems in its gaze, those with orbital planes aligned edge-on to our view from Earth. Planets with large orbital tilts are simply missed by Kepler. “Here’s looking at you, looking at me,” muses Howard. The paper presenting this work, “A Nearby M Star with Three Transiting Super-Earths Discovered by K2,” has been submitted to the Astrophysical Journal and is available for free at http://arxiv.org/abs/1501.03798.